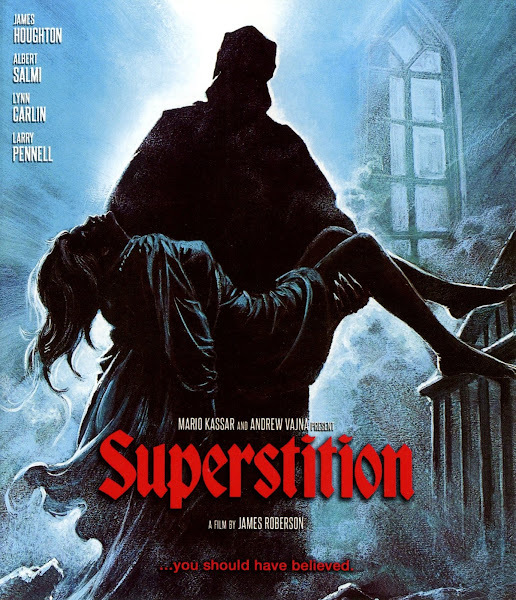 Debuting on blu on the same day as The Manitou is 1982's Superstition, a.k.a. The Witch. Now, this title definitely doesn't meet "draft pick" status (and yes, somebody's already told me I'm using that expression wrong haha) for me like The Manitou, but I have been looking forward to it. I've always remembered this one as being a a fairly average/ mediocre horror film in general, but with a handful of exceptionally cool kills. So I've been eyeing the DVD for years, but it's long OOP and been kinda pricey... Nothing outrageous, but at $25+ for a used DVD in the age of HD, well, that's a 'hold out for a bargain' situation. 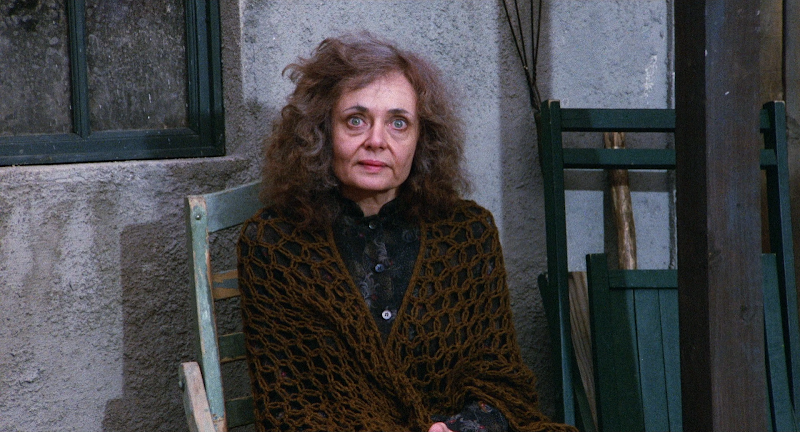 And then Scream Factory announcing a special edition blu-ray restoration for cheaper? It's a no brainer! And now it's tempting to write something along the lines of: in fact, let me explain all of the cheesy ways Superstition is a no-brainer. But actually, revisiting it in 2019, it holds together better than I'd remembered. It's certainly not your "thinking man's horror film;" but if the movie aims low, it at least hits its mark. It's essentially a haunted house movie, where the house is haunted by a witch. In one sense, it actually is ambitious, because this film features extensive flashback sequences taking place in the 1600s that illustrate our back story. So there's some additional back story, an interesting central location (the real house they used is entirely made out of concrete because the owner had a previous, traumatizing experience with a house fire), and some creative, supernaturally-enhanced kills. What there isn't is a lot of story or character. 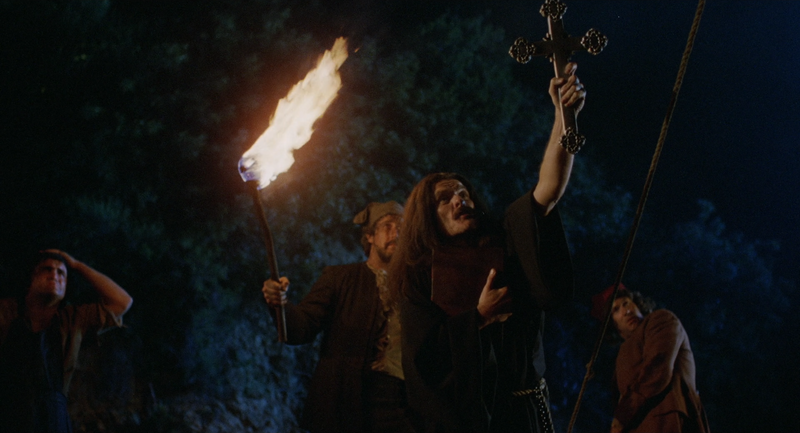 The witch was burned in the 1600s, and now just hangs around the property, delighting in killing anybody and everybody. Everybody else just wants to figure out what's going on and stop the witch before they themselves get killed. That's it. No deeper characterizations or motives, no plot twists or clever concepts, no message or subtext. 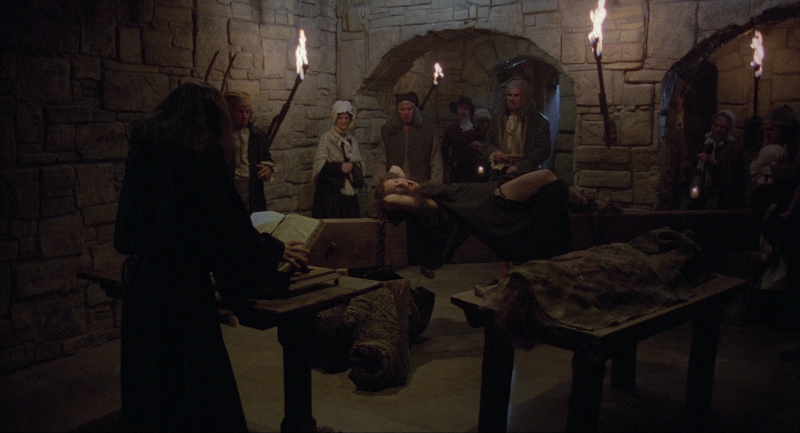 There are a lot of characters, but that's just because the witch keeps slaughtering her way through the cast so quickly, we need to keep bringing in fresh cannon fodder. Sometimes it seems like a character is starting to develop a little subplot or have an arc, but then nope, they're dead, too. You have to hand it to the filmmakers, they keep things moving at a brisk pace. There's no real sense of creepy atmosphere or dread. 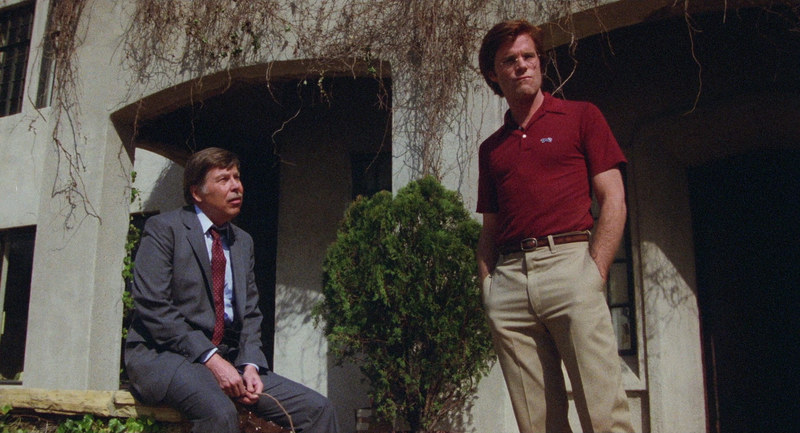 A few recognizable names pop up in the credits (Stacey Keach... Sr), but the performances are pretty uniformly flat. And it never reaches a point where I think people would call it scary, though I suppose it tries occasionally. But stuff looks cool, and will repeatedly elicit cheers from a crowd. So as you've no doubt already picked up from the opening paragraph, there won't be any comparison in this post; I've never owned any of the DVD editions. But it was released in various regions around the world, including in 2005 by Momentum in the UK and 2006 by Anchor Bay in the US. My understanding is that they've pretty much all been anamorphic widescreen but barebones. But now, on the 16th, we're improving on the lot with a new, HD transfer and proper special features. Oh, and supposedly on the Momentum disc, "[a]n extra :08 of the police dragging the lake at the 17:00 mark has been added. This info is from BBFC." Again, I don't have it, but I've compared Scream's new blu to the handful of versions I've been able to find online, and either they all have that additional eight seconds or none of them do. There is a few seconds of the police pulling seaweed out of the lake at around that time-code, but I'm not sure if those are the exact seconds being described, or if that shot is even longer on the UK DVD than it is anywhere else. Regardless, I can't say eight seconds more or less of that footage would change my appreciation of this movie at all. 2019 US Scream Factory blu. What we're looking at here is a brand new scan of "the original film elements," which means not the negatives, otherwise they would've said so, but probably the inter-positive or something. It certainly looks better than a surviving print. Grain is very distinctly captured. 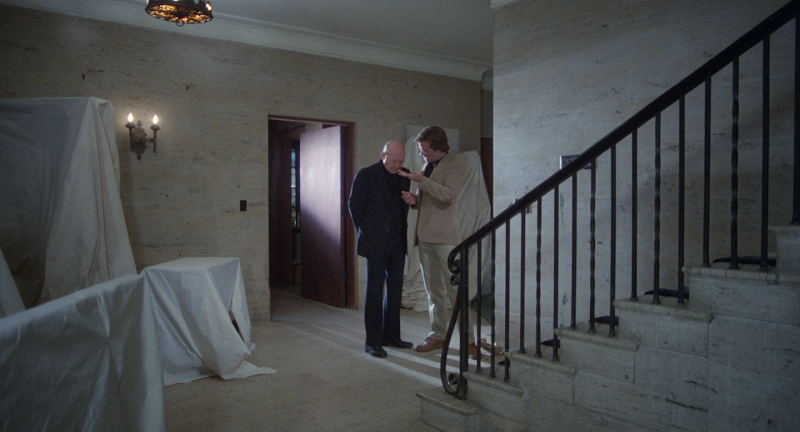 I mean, admittedly, you can see it patch up in sections, which wouldn't have happened in a 4k scan, but that's only when you're zooming in screenshots to 250% to examine the walls in the background (try it on that shot of Albert Salmi and James Houghton mackin' on the front steps). In motion, it all looks pretty flawless. Framed at 1.85:1, lines are clear and distinct without any tinker-y enhancement and the colors are strong but never over-saturated. Someone did a really nice job with the color timing here. Our audio options are pretty simple, we get the original mono track sounding quite clear and robust in DTS-HD with optional English subtitles. As with The Manitou, Scream Factory doesn't label this one a Collector's Edition, and while we get some neat stuff on here, it's a little easier to see why. The bulk of the special features are comprised of two on-camera interviews, one with director Robertson and one with Houghton. At first I was worried these were going the way of The Manitou extras, where they talked about everything except the movie at hand. But it turns out they're both just fairly long (roughly a half hour each), and the interviewers were taking their time and being thorough. Eventually they each talk a good deal about Superstition, and answer a lot of questions fans would have, and even address some points fans wouldn't have known to wonder about. Besides those, though, we just get a trailer, which seems like it was edited, as it has a title card for The Witch, while the voice-over says "Superstition," and then it ends with a Superstition title card. It also comes with a more straight-forward Superstition TV spot, and a reversible cover featuring the common DVD artwork of the dead hand holding the rosary.